In comparison to other states in the U.S., Iowa is considered one of the most reasonably priced places to reside. In fact, a recent article published by USA Today ranked Iowa the ninth cheapest state to live in. 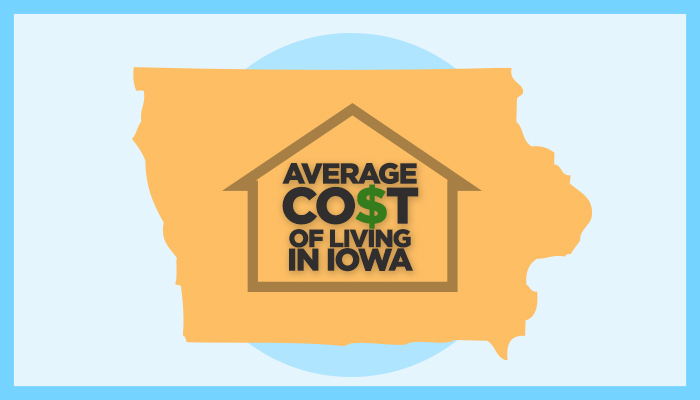 So, what is the average cost of living in Iowa, and what expenses can homeowners in Iowa anticipate? Here’s the breakdown! A homeowner’s mortgage payment varies depending on several factors including the cost of the home, interest rate, and repayment terms. Mortgage payments in Iowa are among the lowest in the nation, averaging out to about $900 a month. Homeowners insurance protects you from disasters like theft, fire, natural disasters, personal injury and more. Insurance premiums vary depending on where you live, the age of your home, the size of your home and the type of home you own. On average, Iowans are met with a monthly insurance payment of about $61 or a yearly fee of $734. Property taxes are based on the assessed value of your home, so the more expensive the home, the more you have to pay in property taxes. Iowa property taxes are primarily a tax on “real property,” which includes land, buildings, structures and other things constructed on land. The median property tax rate in Iowa is 1.29%, and the average home value is $128,700. Based on these numbers, Iowans pay around $1,660 in property taxes a year. Utilities for a home generally include water, electricity, gas and garbage service. For a family of four in Iowa, the water bill can range between $45 and $60 each month. The average electric bill for homeowners in Iowa is approximately $90 each month, and gas bills average around $60 per month. Waste removal services can range between $10 and $20 per month, depending on availability and location. Use a calculator provided by Iowa State Extension and Outreach to calculate the suggested grocery spend based on the age and gender of your family members. For example, a family of four can anticipate spending around $650 each month on groceries. Cable and internet have become a staple in many homes throughout U.S. Iowans can expect to anywhere from $40 to $139 for cable and internet, depending on their location and available providers. A middle-of-the-road plan averages $70 per month. In addition to low-cost living, Iowa boasts some of the best schools in the nation, beautiful parks, and loads of genuinely nice people. If you are looking to make the move to Iowa, contact Space Simply online or at (515)423-0899 today!